The movie industry has spent nearly every summer for the last 15 years trying to unite the people behind watching their world get systematically blown up real good, hoping that each time they set New York on fire or smash the White House that it will evoke the same strange mix of visceral, nihilistic thrill and patriotic pride as 1996’s Independence Day. Many of those attempts have been led by director Roland Emmerich himself, so it’s no surprise to hear that he’s finally given up on finding new, not-so-subtle angles to recreate Independence Day and just started pushing to make some sequels already. Fox has similarly been working on the project since 2009, planning to shoot back-to-back the two follow-ups, which will tell one big story. One big, loud story. 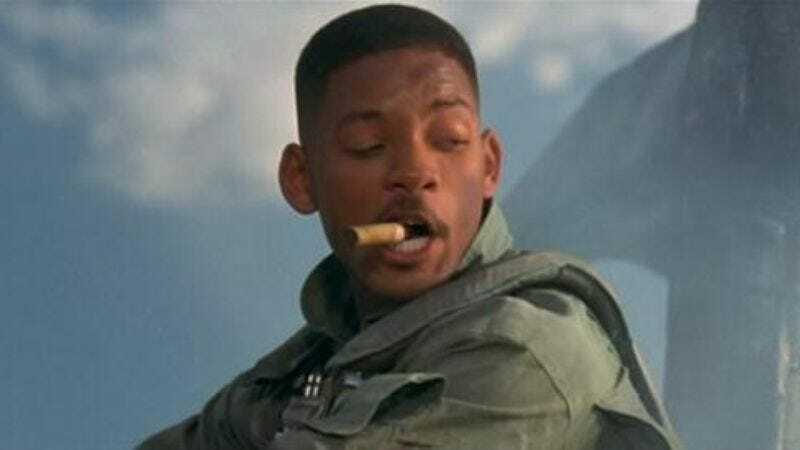 However, the deal remains stymied by Will Smith’s exorbitant, $50 million asking price to come and punch more aliens in the face, along with his other, more recent demands such as strict control over the script (as seen in the recent stagnation on Men In Black III), and finding parts in the movie for wife Jada and daughter Willow. But today Vulture reports that the studio is expected to have the scripts in hand for ID2 and ID3 by December, and that it’s considering moving forward without Smith if necessary—though obviously that means less Will Smith bucks, as his face on a movie poster still causes overseas moviegoers to involuntarily begin spewing euros from their lederhosen. And of course, it would be unthinkable on our end, as we’ve all just agreed to pretend that this project requires integrity and continuity of character. After all, no amount of pretty fireballs will distract us from wondering why that charismatic pilot isn’t here to welcome us, again, to Earth, and remind us that highly evolved alien races are no match for America’s street smarts.